One29, an Elm Street restaurant featuring American contemporary cuisine and located the former Chef Luis space, has closed after a months-long run downtown, according to a worker at the eatery. The restaurant stopped operating as One29 on Sunday, according to a man who answered the phone there, but has remained open under new auspices. Baldanza is moving up from “the alley” at 17 Elm St., and now is operating in the larger space, the worker said. At least some of the One29 staff is staying on with Baldanza, he said. 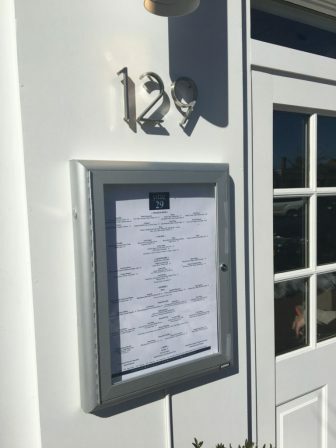 According to a post on Baldanza’s website, that restaurant will officially open Sept. 4 at 129 Elm St. Many New Canaanites still associate the commercial space there with Chef Luis, a hugely popular restaurant run for 10 years by chef Luis Lopez. Following Lopez’s departure, the restaurant “relaunched” earlier this year at One29, moving away from the Chef Luis brand under new ownership and with a new name, look, menu and executive chef (Joe Page). It isn’t clear why One29 closed. Its owner was not immediately available for comment. A huge congratulations to Baldanza….. they will thrive is this great space. They have always needed a bigger space to share and showcase their fabulous food and hospitality!